Designing 3D printed pin hinges, no assembly required: This person unfortunately doesn’t seem to mention the type of printer they used (since different types of 3D printer might make a certain design easier or harder). The pictures look like the kind of thing we print, though (the layered look suggests it). You can try to bring in some models into Tinkercad by using the Import function on the right hand sidebar; if you import from a file, it needs to be STL format. There is a file size limitation, though. Unfortunately, the nature of Tinkercad makes it so that if you import the STL, you can’t really pick it apart very well (other than just creating holes and subtracting parts of the original model); but it might still be a useful exercise to wrap your mind around how the item was designed, especially if you start cutting away into it to see the insides. Here’s another hinge design, this one made in 123D Design. Lynda.com video course – Desigining replacement parts with Tinkercad: this doesn’t address moving parts but I think the section 3 on printing and testing seems useful. I’m having a bit of a tough time finding information on designing hinges specifically for 3D printing, so some more general information might be useful as well. Hope that’s useful to somebody out there! This entry was posted in Tips & Tricks on 2016-11-23 by Will Vanti. Just in time for busy season, the Makerbot’s been repaired and you should be able to see it at work in the glass cage by the printers in the Science & Engineering Library. This entry was posted in Tips & Tricks on 2016-10-29 by Will Vanti. Welcome back, students! We had a rather quiet summer in the library but we’re going to hit the ground running in the Fall semester. Subscribe to our newsletter and stay informed of all the cool stuff we’ll be offering this year. In the meantime, you may have noticed the Makerbot has been inactive lately. We’re waiting on a replacement part so we can do surgery on it, and then (fingers crossed) it will be good as new. The Flashforge has been picking up the slack, though, so prints are still being steadily produced — check out our policies and instructions from the menu above and send us your models! This entry was posted in Tips & Tricks on 2016-09-06 by Will Vanti. Updates will be few and far between over the summer, but rest assured we are still here, prototyping your models and making your artwork come to life! Visit our Getting Started page and review our Policies and submit a model today! This entry was posted in Tips & Tricks on 2016-06-06 by Will Vanti. We don’t have a hot glue gun around the library, but if you’re reading this and have access to the necessary items, this video shows a pretty simple way to build some articulation in your models. Please visit our Getting Started page! This entry was posted in Tips & Tricks on 2016-04-01 by Will Vanti. tl;dr: maybe you should avoid having a 3D printer in your dorm room firing off ABS models. Azimi, P., Zhao, D., Pouzet, C., Crain, N. E., and Stephens, B. (2016). Emissions of ultrafine particles and volatile organic compounds from commercially available desktop three-dimensional printers with multiple filaments. Environ Sci Technol, DOI: 10.1021/acs.est.5b04983. Previous research has shown that desktop 3D printers can emit large numbers of ultrafine particles (UFPs, particles less than 100 nm) and some hazardous volatile organic compounds (VOCs) during printing, although very few filament and 3D printer combinations have been tested to date. Here we quantify emissions of UFPs and speciated VOCs from five commercially available filament extrusion desktop 3D printers utilizing up to nine different filaments by controlled experiments in a test chamber. Median estimates of time-varying UFP emission rates ranged from ∼108 to ∼1011 min–1 across all tested combinations, varying primarily by filament material and, to a lesser extent, bed temperature. The individual VOCs emitted in the largest quantities included caprolactam from nylon-based and imitation wood and brick filaments (ranging from ∼2 to ∼180 μg/min), styrene from acrylonitrile butadiene styrene (ABS) and high-impact polystyrene (HIPS) filaments (ranging from ∼10 to ∼110 μg/min), and lactide from polylactic acid (PLA) filaments (ranging from ∼4 to ∼5 μg/min). Results from a screening analysis of potential exposure to these products in a typical small office environment suggest caution should be used when operating many of the printer and filament combinations in poorly ventilated spaces or without the aid of combined gas and particle filtration systems. We are not aware of any relevant information regarding the inhalation toxicity of lactide, the primary individual VOC emitted from PLA filaments. So, good news? 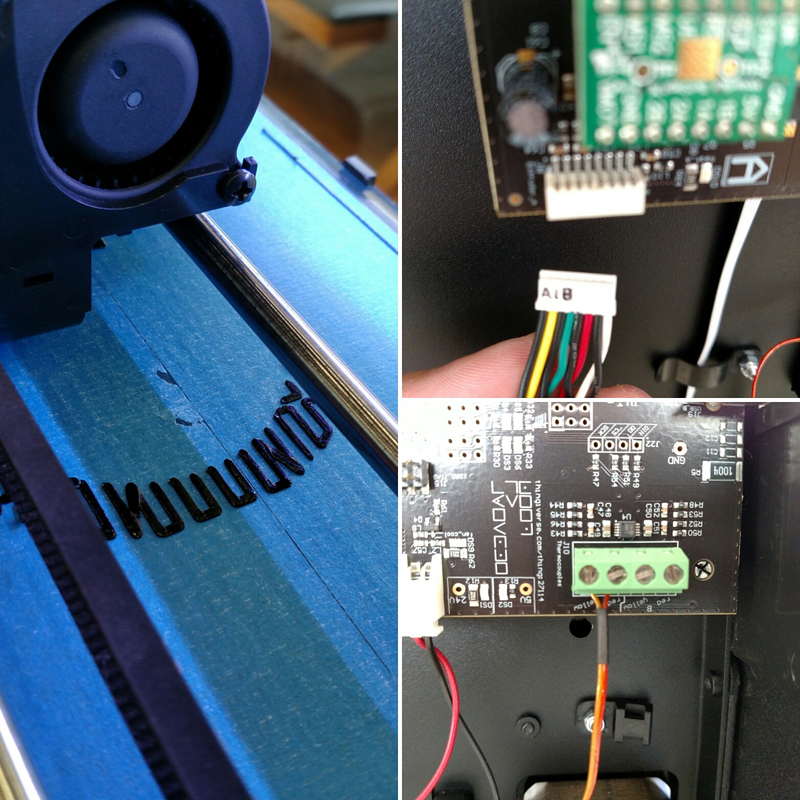 It’s still early days in the analysis of this rapidly-growing technology from a general consumer perspective, so it’s probably prudent to operate your printer in a well-ventilated area, particularly if you’re using filaments other than PLA. This entry was posted in Tips & Tricks on 2016-02-01 by Will Vanti. Welcome to the new homepage of the Digital Science Center’s 3D printing service. The old page functioned as a repository of submitted designs, but it was largely a faceless entity; we hope to make this new version of it a bit more lively. If you’re reading this particular post after clicking on the ‘Tips and Tricks’ link on the navbar, the plan is to have more posts with ideas and suggestions about how to succeed with 3D printing design. This entry was posted in Tips & Tricks on 2015-08-26 by Will Vanti.